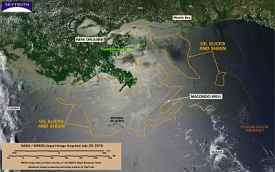 The federal government and media is reporting that the BP gulf oil spill has disappeared but satellite photos show a slick covering over 12,000 square miles of the Gulf. According to John Amos over at Sky Truth all of that oil that magically disappeared isn’t going away just yet. I tend to agree with the speculation about Bonnie dispersing the oil beneath the surface and now that the waters have calmed, the oil is resurfacing. I actually see the phenomenon with the oil in the bay around my house. When the wind is blowing or if there is even a slow current from the tide I can’t see any oil in the water. But when the winds are calm during slack tide you can see oil throughout the entire bay and can sometimes actually watch it rise to the surface. I have been seeing tar balls since the end of May and posted a video about it when I found tar balls washing up on the beaches around Brick, N.J. I originally wrote about finding an unusually large amount of oil in the water behind my home and in the surrounding waters in Barnegat Bay, N.J., back on May 22. Since then I have continued to see oil in the water and have on occasion videotaped it and taken pictures. One example is this video taken July 7, 2010, which shows my lagoon filled with droplets of water and the oil floating to the surface from underneath the water. The video above was taken at my house which I located on point A on the map below. 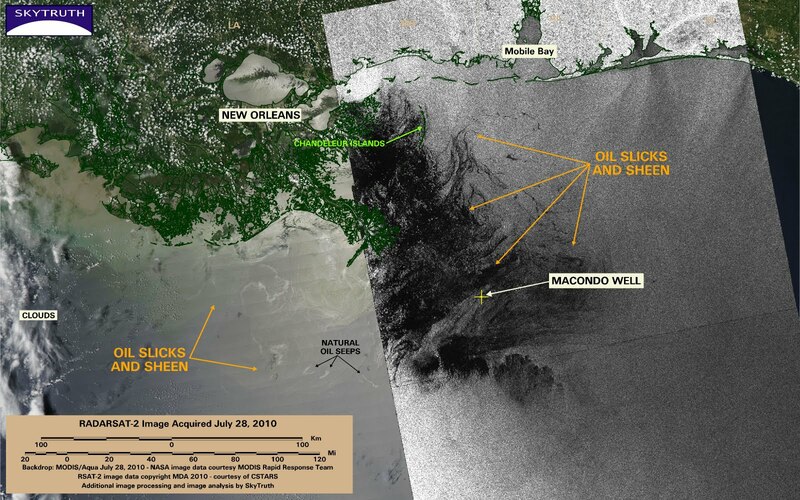 Also notice the large slick of oil off the coast of the Louisiana and Mississippi coast. That is important because the government just reopened those waters to fishing yesterday based on visual observation of there being no oil in the water. If the federal government wasn’t ignoring their own protocols and had actually tested the water for oil they would have found the invisible underwater plumes of toxic oil and the waters would have remained closed.